TRIED AND TRUE: “You try to please your audience. 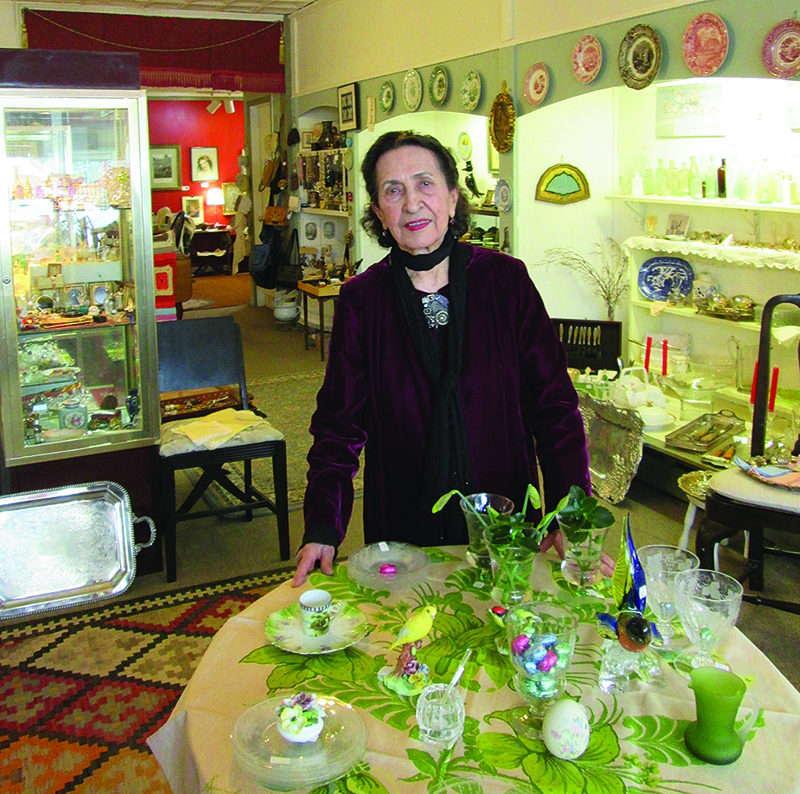 We offer a little bit of everything: furniture, glassware, china, silver, jewelry, linens, and more.” Mahbubeh Stave, owner of Mahbubeh’s Antiques in Hopewell, is shown beside a table setting with vintage glassware and dishes in a springtime display. For those who appreciate something different, an item with a story to tell, a history, and something with quality craftsmanship and taste, Mahbubeh’s Antiques in Hopewell offers an intriguing selection. Antiques, collectibles, and vintage pieces are all on display in a welcoming, uncrowded setting. Over the years, Mahbubeh has had the ability and opportunity to discover and identify fine quality antiques and vintage pieces. She also met her husband in New York. George Stave, an American artist of Norwegian ancestry, who became known for his skill in oils. A section of the store serves as a gallery for many of his paintings. Eventually the couple moved to Cranbury, and Mahbubeh later became involved with the Antiques Emporium in Hopewell. She opened her own store in the 70s, and had five locations in Hopewell before establishing the current location at 35 West Broad Street. The quest to discover fine antiques is an art in itself, and Mahbubeh’s search has taken her to house sales, auctions, and flea markets. In addition, people often bring items to the store for her consideration. The selection is extensive, including furniture, glassware, china, silver, jewelry, linens, and a variety of miscellaneous items. Mirrors are not only functional, they are decorative, and can add new dimension and a distinctive look to a room. Of particular interest is an Italian trumeau vintage mirror, featuring gilt frame and painted panel above the glass, an elegant addition to the decor of the home. Another specialty is an American trumeau mirror from the Federal period (1780-1830), also with gilt frame and a reverse painting at the top, a fine piece representative of a time in early American history. Mahbubeh’s attractive displays often feature tables arranged with a variety of dishes, glassware, and cups and saucers. Included is a selection of beautiful French oyster plates, small Irish Belleek pitchers, bowls and dishes, lovely vases, and assorted cut glass pieces, including decanters and cordial glasses. Bottles have been a popular collectible over the years, and Mahbubeh offers an interesting display of assorted sized bottles placed near a painting featuring bottles. She believes this can give customers suggestions in arranging a grouping of their own collection of bottles. Furniture includes a variety of pieces, with a handsome Victorian love seat of hand-carved walnut, a standout. It would be an impressive addition to a library or living room. The selection of vintage jewelry includes bracelets, necklaces, brooches, and earrings in many styles. Of special interest is the collection of clip earrings, which are often hard to find today. An assortment of embroidered and appliquéd handkerchiefs will also please those who know how hard it can be to find those in stores now. Mahbubeh’s selection is lovely, including hand-done cotton and linen from France, Switzerland, and Madeira, Portugal. Everything from vintage postcards and pictures to candlesticks, butter picks, lemon and olive forks to a fascinating collection of electrified kerosene lamps will catch the eye of those who come to browse and to buy. Mahbubeh has had, and continues to have, many regular customers who appreciate the special pleasure of finding quality, often one-of-a-kind antiques. She also notes, however, that interest in antiques has diminished somewhat in recent times. Mahbubeh is also pleased to offer a gallery of her late husband’s paintings in a section of the store. These oils on canvas are available for sale, and exemplify particularly lovely color combinations, use of light, and a sense of intimacy. An especially charming shop, Mahbubeh’s Antiques is filled with many intriguing items. In addition, the owner’s expertise and knowledge, which she willingly shares with customers, enhances a visit to the store. The wide price range is another plus, with many items at very reasonable cost. The store is open Tuesday through Saturday 10 a.m. to 5 p.m., Sunday 11 to 5. (609) 466-6799. Gallery website: www.george-stave-paintings.net.